"Tempering is a heat treatment technique applied to ferrous alloys, such as steel or cast iron, to achieve greater toughness by decreasing the hardness of the alloy. The reduction in hardness is usually accompanied by an increase in ductility, thereby decreasing the brittleness of the metal. 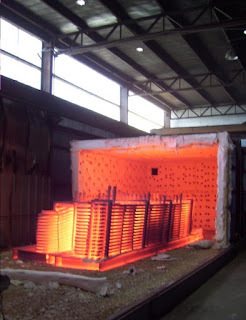 Tempering is usually performed after quenching, which is rapid cooling of the metal to put it in its hardest state. Tempering is accomplished by controlled heating of the quenched work-piece to a temperature below its "lower critical temperature". " The video below shows the testing of a 10 million BTU ratio air burner designed for a custom heat treating furnace used to pre-stress large metal components prior to welding. Hotfoil-EHS manufactures complete furnace systems using OEM burners and in-house developed control systems.